It is very unusual to find my bedroom completely free of bath products, especially bath bombs. I am definitely a bit of a collector of cute bath bombs; you'll find me collecting them from a huge range of different places. I even managed to pick some up from a small market on holiday (queue the ones on the plate). I am a massive magnet to bath products. I first discovered Bomb Cosmetics back about two years ago at a little event my Nan held. At this time they weren't as well-known. 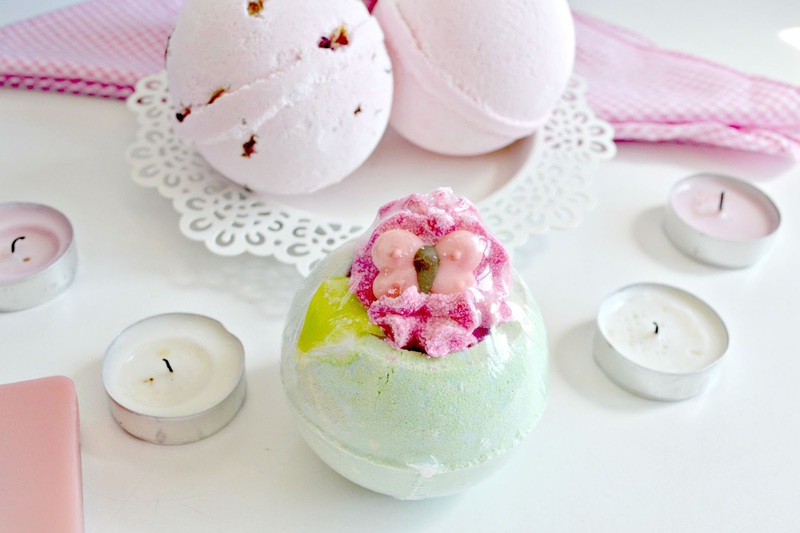 I tried some of their smaller and larger bath bombs then, and I loved them. Sadly, after that I wasn't really sure where I could find them as I don't think they have any stores yet (don't hold me to it, I could be wrong). Anyway, while I was on holiday recently, I rediscovered some of their products, even some I had never tried. Of course, as you can imagine, my eyes widened and I couldn't resist; I just had to buy some. So I popped over to the little table and after about 10 minutes of looking in awe, trying to choose a few products (absolute torture I may have you know), I picked up a few things. When I first touched these products, the first thing that caught my attention was the absolutely gorgeous fruity scents that they gave off. I was just wandering around a shop when a fruity waft came past, sounds like a fantasy doesn't it? It was in my eyes. No matter how much people told me I didn't need any bath products, I was always going to crumble and splash out. I mean, it is my utopia after all. Just imagine a world full of bath products and bubble baths? Heaven! Although I have only had these products for about two weeks, I have already used the majority of them (with the exception of one soap bar). I have so much to say about them, I thought, why not review them and share my love? So here we are. I have to admit, when I first saw the soap bar counter, I did wonder what on earth it was. At first I thought it was some sort of rock collection but then I couldn't work it out because they smelt so sweet. Obviously, when I picked them up I knew they were soaps (I mean, they would have been very weird rocks, but you never know). 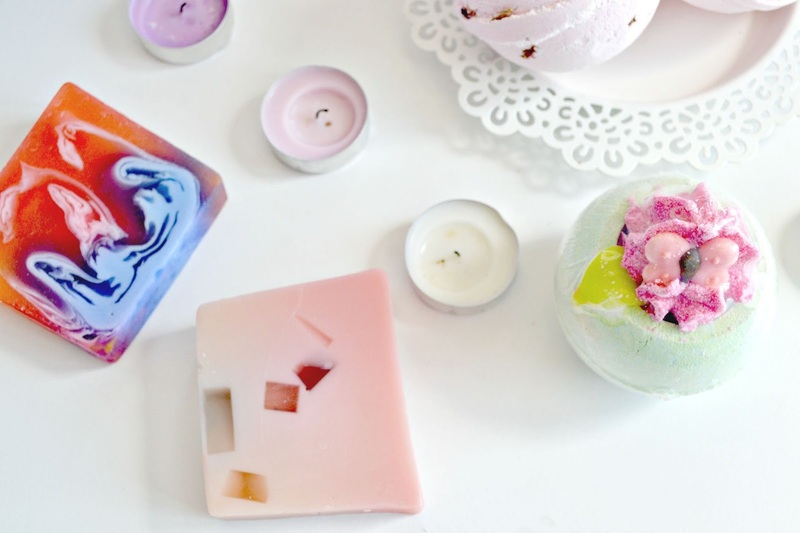 These soap bars have absolutely awesome designs...I mean look at them, have you ever seen a soap so pretty? Personally, my favourite is the Caiperina soap bar (the orange/red one) but the ICandy one smells beautiful, so I picked that one up too. 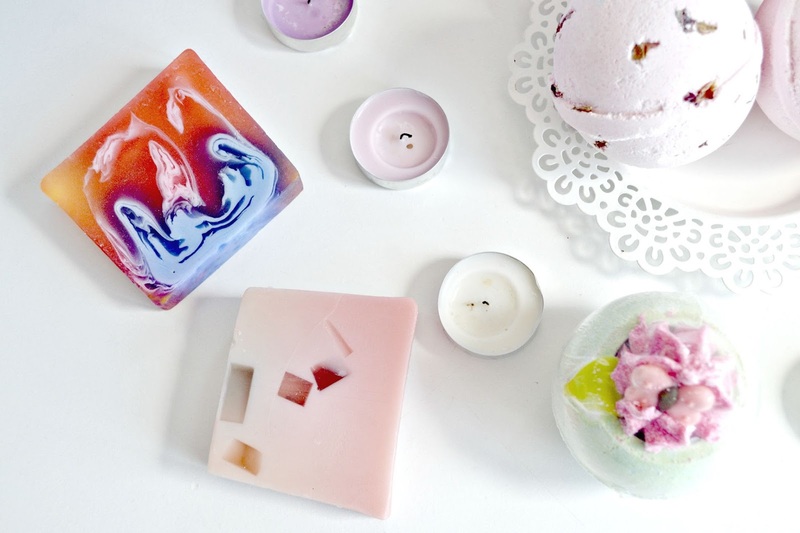 These soaps are super soft which leaves your skin feeling great. I have had far too many soaps that have left my skin feeling dry like a shriveled raisin, but these are just amazing! 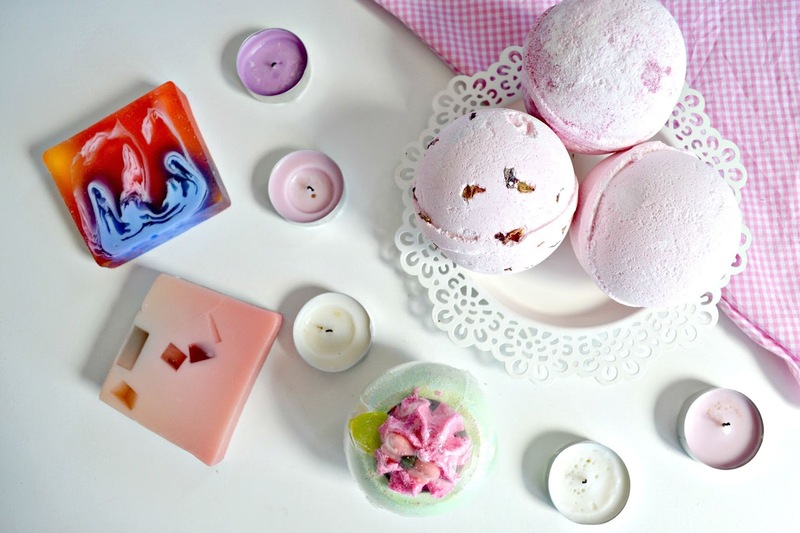 I have super sensitive skin when it comes to soaps, so these will almost definitely be perfect for any skin type. I also find that they make a really good lather - especially on a sponge. I can imagine they will last a little while because I didn't need to use as much soap compared to some other brands. Finally, the scents...they are just amazing! The Icandy one, as you can guess, smells of sweet candy...doesn't take a genius to work that one out. The scent is made up on Brazillian Lime and Grapefruit essential oils, which combines to make a perfectly fruity scent. The Caiperina soap is made with pure clary sage and bergamot essential oils, also providing softening products for the skin. Since I have started using them I have had a few people ask what perfume I am wearing, often when wearing none. The scents linger for hours after use. Flutter By Butterfly, what a cute name to match a cute little bath bomb. I love the little butterfly and green leaf added to this bath bomb. The colours are also absolutely gorgeous, they remind me of the plants and flowers that you find butterflies around in the summer time. To add to the appearance, this bath bomb also smells divine. It is described perfectly as 'A juicy combination of fresh apples and sweet cherries to create an explosion of fruity scents'. It is a fruity heaven. It reminds me of my younger days using sweet shampoos. There's nothing like the feeling of nostalgia! The scent lingers for hours after use but it is only subtle, not too overpowering like some can be. Upon using this product, it fizzed away (is that even a word?) really fast, oozing out bubbles everywhere. It leaves the bath a light green colour, which is different from other bath bombs I have used. The leaf is more soap-like and so lasts longer than the rest of the bath bomb, but otherwise, there is not much residue left behind after use which is handy because who wants to be washing the bath down with the shower head after? Another thing I love about this bath blaster is that they provide a coating around it. I love this because it stops discolouring as much as it would if it didn't have a plastic layer on. It also prevents it getting wet accidentally and allows for more extravagant designs (which is always a bonus). I also love the fact that this product has coco butter inside which explodes out when the product fizzes away. It leaves your skin feeling very soft and pampered which we all love after a long soak in the bath. Overall, I can say that these products have definitely got a thumbs up from me. They are also a relatively cheap brand (website here), so it is a shame they don't have their own stores. Also, these products are suitable for vegans which makes smile A LOT! I love cruelty free products and I am planning a future vegan lifestyle. I will definitely be purchasing more from them in the future. Have you tried Bomb Cosmetics? DISCLAIMER: The products in this post were not gifted, they were bought from my own money. This is also not a sponsored post and it holds my honest opinions. These look so cute! I really want to try them just because they look so pretty!! Those photos are amazing - everything just looks so nice! I want to try all of it now! NAIL POLISH: IS IT WORTH PAYING MORE?